Once known as Multiple Personality Disorder (MPD), Dissociative Identity Disorder (DID) is the subject of film number eighteen of twenty-one in the AMHF series on psychiatry in Hollywood. The Three Faces of Eve covers a most controversial disorder—often outright debunked as the current (as of this writing) DSM-4 had made significant changes to the diagnosis. Characterized by two or more distinct personalities within an individual, DID involves trauma and memory. Its diagnosis overlaps borderline personality, complex PTSD, difficult-to-classify ichtal states, and undoubtedly others. Untreated, it is said DID could lead to self-harm and attempted suicides. 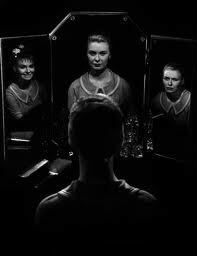 Notable is that Joanne Woodward won the Best Actress Oscar for this complicated three-part role. The plot, modified from Wikipedia, follows. Eve White (Woodward) is a self-effacing wife and mom who has blinding headaches and blackouts. She is sent to see a so-called, personality psychiatrist Dr. Curtis Luther (the ever-reliably excitable—in other productions at any rate—Lee J. Cobb). While conversing, her “alter personality”—wild, fun-loving Eve Black—emerges. Luther considers both White and Black to be incomplete and inadequate personalities. Most of the film depicts his attempts to understand and deal with two faces of Eve. The Cobb character eventually prompts Eve to remember a traumatic event from childhood. Her grief and terror at the time led to her “splitting off” into two distinctly different personalities. But under hypnosis at one session, a third personality emerges: the relatively stable Jane. After discovering the cause of her disorder, Jane is gradually able to remember everything that has ever happened to all three personalities. When Luther asks to speak with White, they discover that White and Black no longer exist. All three personalities are a whole. Eve marries a man named Earl, whom she met when she was Jane, and reunites with her daughter. This film depicts an institutional setting, as seen earlier in Bedlam, One Flew over the Cuckoo’s Nest, Awakenings, Spellbound, The Cabinet of Dr. Caligari, Charly, Don Juan DeMarco, and even in passing Miracle on 34th Street, as Santa Claus is put away for “the delusion” of knowing who he is. The central interest is hypnosis. (As it is central to another film, from an earlier era, not covered in this series: from the UK, The Seventh Veil.) The mesmeric analyst is often looked at with the same suspicion and jaundiced eye that DID is. There appears to be something of the showman and, worse, quack surrounding practitioners of the hypnotic modality. Is this any way to reassemble and “cure” the damaged psyche (which is derived from the ancient Greek for soul)? One wonders. Serious students of DID include Lucy Freeman and Flora Rheta Schreiber. Freeman contended to me, in private meetings (and perhaps somewhere amidst her voluminous published writings) that Marilyn Monroe (sometimes also loosely diagnosed with Histrionic Personality Disorder) was a multiple personality, stemming from childhood and young-adult abuse, coupled with an actor’s keen, prophetic sensitivity. The Three Faces of Eve is a relatively tame look at the entire DID phenomenon, with a fabulous case. It will be interesting to discover what the forthcoming (May 2013 at last word) DSM-5 says.